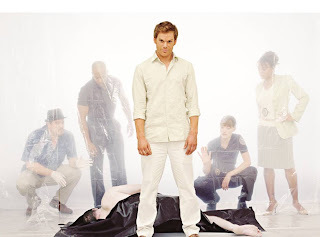 Home » » DVD Review: Dexter: The First Season. 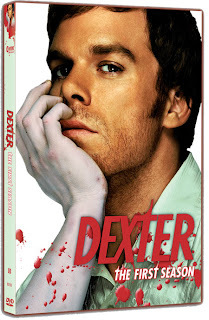 DVD Review: Dexter: The First Season. When I heard that Jeff Lindsay’s character Dexter was going to become a series for Showtime, I was skeptical. Many of the things that made the novels so alluring have the potential to turn off many potential viewers. A main character that is an unfeeling serial killer (albeit of other killers) is not something that many folks will connect with. Lindsay is a talented enough writer that he has pulled it off in the books, could the series producers do the same? Forgive me for having any doubt. They have done a wonderful job. The series stays true to the overall feel of the books. Your feelings race from disgust to glee. After some episodes, I wanted to take a shower, yet could not wait for the next one. The producers (responsible for the cable hits The Sopranos, Six Feet Under and Oz ) take full advantage of the freedom that cable offers and have delivered a show masterful show that is stands out from everything else on the small screen. Early in his life, Dexter survived a traumatic event, one he can not remember. His foster father, Harry, a former policeman, realizes his son lacks the emotions most of us have, and that he is filled an urge to kill that he can’t ignore. Harry channels Dexter’s homicidal urges into good, teaching him to kill only those who deserve it. He also helps Dexter to blend with other folk, teaching him how to emulate the human emotions he doesn’t actually feel so that he doesn’t draw attention to his extracurricular activities. Michael C Hall (Six Feet Under) does a wonderful job as Dexter. By the second episode, his 6FU character was a distance memory. He really brings this character to life, with a certain spark that will help many viewers get past the more… disturbing aspects of Dexter. As for as extras go, we get hosed. There are a couple of commentary tracks, but neither have Michael C. Hall on them. Interesting? Sure, but not having the focal point of the show involved makes them skipable. We are also “treated” to the first two episodes of the Showtime series The Brotherhood. Now I don’t have a problem with that per say, but I would have rather gotten some featurettes about Dexter. There is also a 12 minute look at a real life crime that was solved through the use of blood splatter analysis. Again, that is fine but I want more Dexter related material. But while the extras are weak, the fact is that we are still treated to what I think is the best new show of the last few years. Though certainly not for the soft, Dexter is an amazing show that is should be given a chance by all but the tenderest of views. Won’t you please give Dexter a place in your home?